I learned this trick last year, and it’s awesome. You take a bottle of bourbon (cheap is best, given what we’re going to do to it), you pour out a shot or so, and stuff in as much mint as you can possibly fit in the bottle. Then you wait two days, then you pour it out into another bottle. If you infuse for one day you get toothpaste, and if you infuse for three you get stem-flavored whiskey. This year, the mint has been completely overgrowing the garden, so today I weeded out the actual weeds, and a bunch of mint that was threatening the lilies. 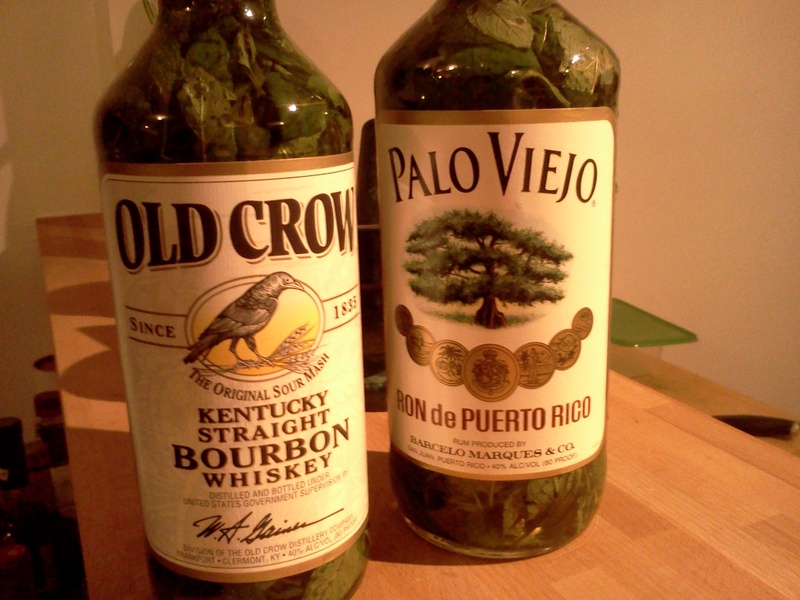 And after a lot of washing and stuffing leaves into bottles, we’re two days away from awesome mint juleps! I got some rum, too, and we’re trying that in case it yields similarly awesome mojitos. I’ll let you know. I did the mojitos again with a few fresh mint leaves in, and it really helped – in the infusion you get a single clear minty flavor, but with the muddled mint you get a much bigger range of mint flavors (the grassiness, the bitterness, even the texture of the leaves in the drink, all changing from bite to bite). The Juleps with the bourbon work very, very well, even with no fresh mint.